The global land and ocean surface temperature for June-August 2018 was 1.33° Fahrenheit (0.74 °C ) above average and the fifth warmest summer on records. Looking at land temperatures only, 2018 was the fifth highest June-August on record. Looking at sea surface temperatures, our global oceans also experienced the fifth warmest summer on record. Of note – the last five years (2014–2018) comprise the five warmest June-August on record. 2016 was the warmest summer so far, boosted by a strong El Niño. In the United States, the average temperature for the Lower 48 was 73.5°F, or about 2° above average, tying with 1934 as the fourth warmest summer on record. The summer precipitation total for the contiguous U.S. was nearly 9 inches, over half of an inch above average, ranking summer 2018 us as the 25th wettest summer on record. The nationally averaged overnight low temperatures were record warm this summer, 2.5 degrees above average – beating out 2016 for the warmest summer nights on record. In general, the U.S. summer overnight low temperatures are warming at a rate nearly twice as fast as afternoon high temperatures. The 10 warmest summer minimum temperatures have all occurred since 2002. Hot and dry weather in the Southwest contributed to another devastating wildfire season this past summer, especially in California. The Mendocino Complex fire north of San Francisco became the largest on record at 422,000 acres, or 660 square miles, or roughly half the size of the state of Rhode Island. Five of the seven largest fires on record in California have occurred since 2012. But California wasn’t the only state battling wildfires – several neighboring states and Canada also experienced large and prolonged wildfires. 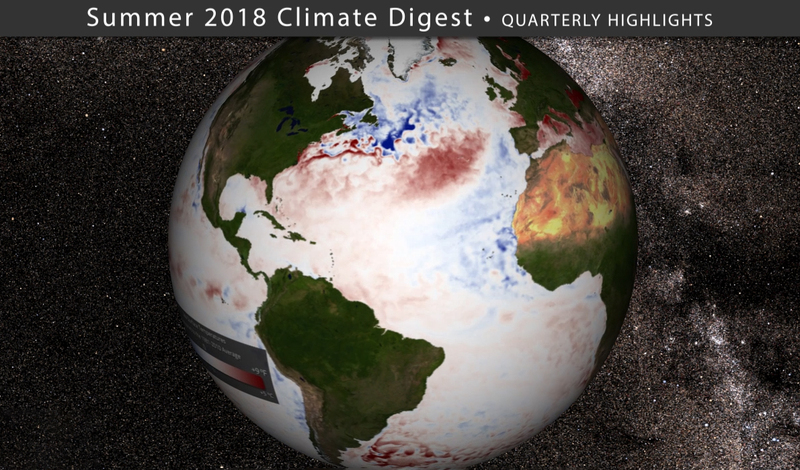 The quarterly climate digest, produced seasonally, consists of a short movie (4:17 minutes) made for Science On a Sphere® (SOS) and an MP4 video accessible through YouTube.